Reubin Norris: Born in 1835 in Alabama, married to Hanor E. Norris, farmer, father of 10, one of which was a William R. Norris (born 1861). My great-great grandfather William R. Norris was born in 1859, according to both the 1900 census (which you’ll see shortly) and his tombstone. Both seem like fairly substantial proof that this is the wrong William. This is a little sad, because Reubin and Hanor would’ve been fun names to add to my tree. They’d go well with Z.S., Tarpley, Kenyon, and well…you haven’t met them yet, but… Elisha and Hirim. Nathan J. Norris: Married to Mary A. Norris, 3 children, including a William Norris (estimated birth year 1860). 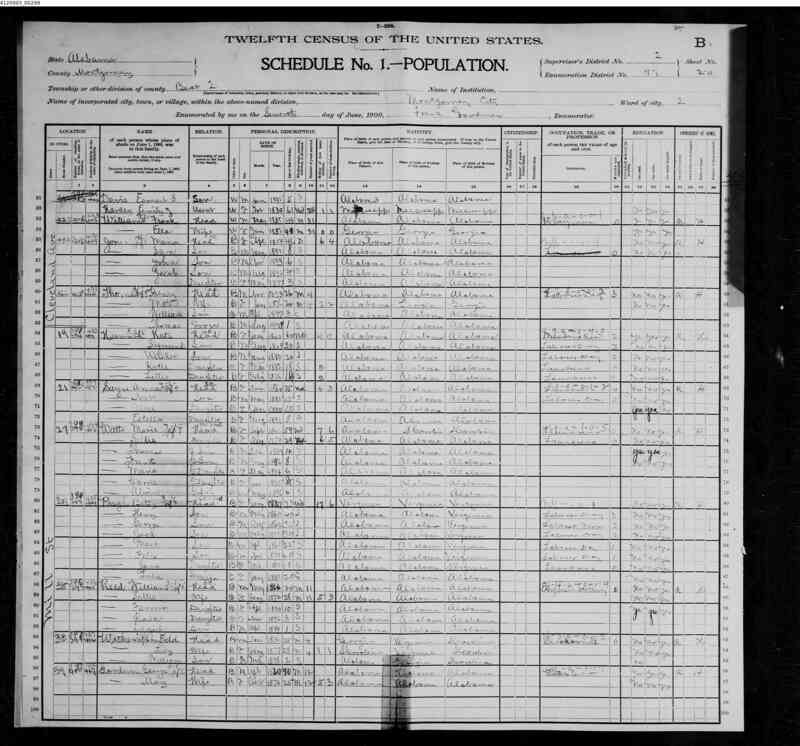 Check out the 1900 census, in which I placed William and Minnie in Alabama in 1900. They’re at the very bottom of the page. Here it says that William was 40-years-old, a milk dealer, born in Alabama, married for 14 years, and that his father and mother were both born in Alabama. A milk dealer? Check out page 2 of this 1900 census entry for the Norris’ as well. They’re at the top of the page. I actually didn’t realize that this was a continuation of the Norris’ from 1900, until I saw additional entries in the familysearch.org listing. FamilySearch is an interesting site created by The Church of Jesus Christ of Latter-day Saints. . Actually it creeps me out a little bit that they’ve created this HUGE database with as many ancestry records as they can find, but… I digress. What’s cool about this site is that they’ve transcribed tons of records, including the census records. It’s also fairly easy to search, and it’s free. If you don’t have access to HeritageQuest.com or Ancestry.com for free, then this is a good option. 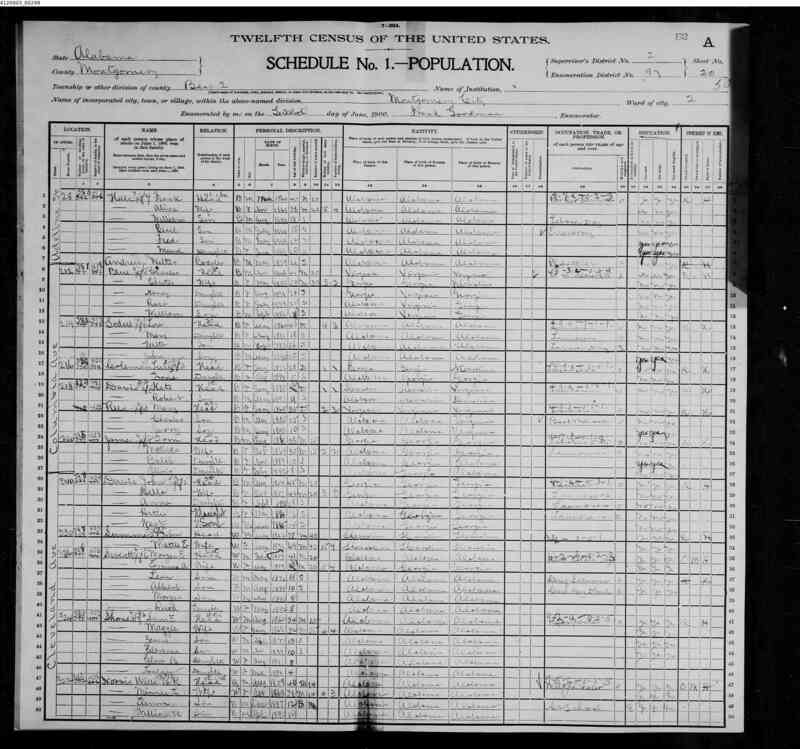 Since I’d last done research on the site several years ago, they’ve added scans from the census pages as well, and you can save those to your computer just as you can from HeritageQuest or Ancestry. Moving forward, though, in searching for William on FamilySearch, I noticed two additional children transcribed from the record, which I hadn’t noticed before. Looking at them confused me completely, because as far as I knew my great-grandfather Doc only had two brothers. Also, Doc (Samuel Earnest) wasn’t listed. Then, noting the birth year and age of Earnest S. Davis I realized it matched that of Samuel Earnest. I have no idea why he was listed this way in the census record. In addition, the “daughter” that FamilySearch had transcribed was actually listed as an aunt of the head of household, William, in the original census document. Both of these factors make for an interesting lesson. First of all, be sure to check the actual record against what has been transcribed. People make mistakes, and so it’s always a good idea to check what they’ve seen with your own eyes and make your own interpretation of what is written down. In this same census record, my great-great uncle Elmer was transcribed as Eleanore. One might wonder, whether this census transcriber was in their right mind when transcribing. The other lesson to take from this is that census records themselves may not be accurate either. Remember that they were filled out by whoever answered the questions. In the case of these older handwritten records, they were also filtered through the census taker. Once again, people make mistakes. Something interesting to note in the case of my great-grandfather, however, is that this isn’t the first time his first name was written down as Earnest instead of Samuel. This was also the case in the 1920 census in El Paso County. Remember? Also, my mom vaguely remembers him having a second middle name, which would explain the “Davis” in his name. Of course, she thought it was Woods not Davis. After another 1870 record with a 10-year-old William (son of George, born in South Carolina, and Margaret, born in Alabama), I go back to a record I’d found previously on HeritageQuest, which seems the most promising. Here, what has been transcribed on both HeritageQuest and FamilySearch as Alanson Norris (what do you think it says?) has several children, including William Norris, 11. BINGO! Everything seems to match up here, except the birthplace of William’s father is wrong. Here, once again, South Carolina is listed as his birthplace. I believe what we have here is a roadblock. As far as I can find, this is the only William Norris born in 1859 in Alabama, making this the best lead I have as to finding another generation of Norris’ back. Of course, there’s a good chance that once again this is the wrong William.